The positive effects of Meet Your Mentor, a mentorship program in partnership with the Orange County Corrections Department and Orlando’s Cherokee School, are evident in local high school student Toniesia. As one of the 2009 inaugural class members, Toniesia now earns excellent grades, is active in Reserve Officers’ Training Corps (ROTC) and remains grateful for the opportunity to have been part of the program that positively changed her life. That motivation and desire to excel wasn’t always a priority for Toniesia. She is the first to admit that she may have been a handful for her teachers as well as her family when she was younger. As a result of her behavior, she was paired with a correctional officer who served as a mentor. While the relationship took time to foster and grow, her mentor remains an important part of her life today. In fact, the duo recently reunited at the Cherokee School to help kickoff another year of the program. This year, Toniesia even had the opportunity to address the new group of young program participants. The program is designed to serve as an alternative to other more publicized programs that emphasize exposing young students to the harsh realities of prison life. 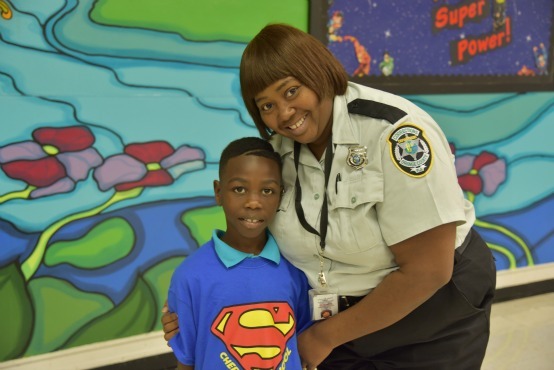 This unique partnership matches a member of the corrections team, either civilian or certified, with a young student for an entire school year. While each child’s story is unique, many have already been exposed to financial hardship, the foster care system or even law enforcement. Often, this type of exposure prompts many children to react in a negative or destructive manner. After experiencing negative behavioral challenges in their home school, children attend Cherokee for a second chance. The goal of the teachers and the corrections team is to support the children and their families so they can successfully return to their original schools. Correctional staff dedicate one hour each week to their mentee, although most go far beyond that commitment. They offer guidance, support and coaching. The goal is to direct these young students away from the attention of the criminal justice system and towards a better, more successful life path. Chief of Orange County Corrections Cornita A. Riley believes the program fills a critical need in the community. School officials report that after participating in the program, students show a 90 percent increase in attendance and 63 percent have fewer disciplinary calls. About 71 percent of the participants increase their reading scores and most transition back to their home school and go on to become successful young adults.